Fujifilm Instax Minion Instant Camera is one of the cutest cameras you can find in the market today. It can be a perfect gift for any Minion fan or collector. The camera is originally created for the Japanese market but now available in Amazon too. so you are looking for a fun camera for a kid then here is a perfect gift. It’s easy to operate and has no complicated functions. Simple and cheap camera for a small child. or even for a Teen who loves Minion theme. Fujifilm Instax Minion Instant Camera is a perfect Gift! Instant photo camera might be something from past. But, now these becoming a trend again. Also, these cameras instantly print photos so might be great for events like birthday parties of kids. Your kid or grandkid can take photos with friends as well as family members. Create a scratch book about the event or even give those to friends. It’s an amazing way to make memories. 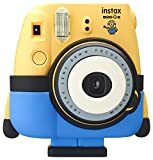 It’s a Minion in an Instax Mini 8 Instant camera! This Fujifilm Instax Minion Instant Camera is basically an Instax Mini 8 camera without Minions outer design. Fujifilm has released another similar theme camera a few years back. That’s Instax Mini Hello Kitty limited edition instant camera. Even though Mini 8 is a bit old model it’s a very good instant photo camera. Very easy to use and One of the cheapest instant photo cameras in the market. The camera uses AA batteries which are easy to find. Or, you can buy a couple of rechargeable AA batteries which would be more economical since you can reuse those many times. Instax Mini Film Packs are Cheap too! All Fujifilm Instax mini cameras use Fujifilm Instax Mini film packs. These new film packs are similar to Polaroid’s Zink photo paper. There are many advantages like a cheap price, the durability of printed photos, no duds like an old Polaroid film packs. Price per photo would be less than 1 USD for basic film packs. But there are theme packs which come with beautifully themed borders. For example, there are Minions theme mini film packs. Today, kids are very smart. They can easily adapt to new technology. But also it’s important to let them understand there are more ways to enjoy their free time without a computer or smartphone. Giving them a cute camera like this and let the feel the satisfaction and joy of having a photo print in their hands rather than a digital version help them to think little differently. There are lots of theme film packs in the market. These might come handy if you are going to do a themed event. let’s say a Minion theme kids party, you can use the related film packs and give all kids cute photo prints of the party. Something that will make all kids happy and they will treasure the photo. Other Cute Cams Apart from Fujifilm Instax Minion Instant Camera? Fujifilm has lots of very pretty instant camera models. Another good example is Fujifilm Instax Hello Kitty camera. This Limited edition instant cam has a Mini 8 core just like the Fujifilm Instax Minion Instant Camera and amazing Hello Kitty design. It’s very unique and now becoming very hard to find it market. There are plenty of other cheap instant camera models too, and some are more advanced and expensive. If you are looking for a cheap instant camera then the latest models you can go for are, Fujifilm Instax Mini 9 and Polaroid Snap camera. Fujifilm Instax Square 10 and Square 6 cameras use bigger photo paper. Also, there are instant digital cameras. These models have features like WIFI or Bluetooth connectivity and the ability to save photos into a memory card. Now finally I have founded this perfect gift for my kids. They care crazy about Minions items. I want to introduce them to world of photography but I like to start with an instant camera. They will love to look of this camera and also Instax mini film packs are not too expensive. I look around it seem these new film packs are lot better than what we used to have for those Polaroid cameras when We were kids. You might want to get few packs of those Minion themed Instax photo paper packs too. Those would go well with Minions Instax Mini camera. But for daily use get one of those big budget packs. It will save money to buy even another pack. These new photo paper is great in quality and also durable. Im sure your kids will love these instax Instant cameras!